The Alfa Romeo 164 was the last of the Type 4 Project cars developed jointly with FIAT, Lancia and SAAB. It was North America’s first experience with a FWD Alfa, as the Alfasud was never sold here. Another Alfa never sold here was the all wheel drive version of the 164, the 164 Quadifoglio 4 or Q4 for short. 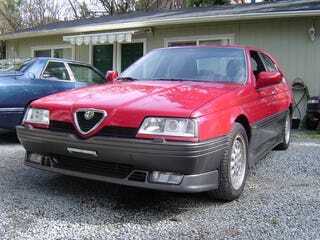 Find this 1995 Alfa Romeo 164 Q4 sale in Victoria, BC for $24,000 via craigslist. The 164 was the last car to be developed by Alfa Romeo as an independent ward of the State company prior to being given away to FIAT by the Italian government, so it shares less with its FIAT Croma and Lancia Thema Type 4 siblings than you might think. Powering the 164 Q4 was the ultimate evolution of the Giuseppe Busso designed V-6, the 3 liter with 24 valves, producing 230 hp. As with the 12 valve V-6, religiously replacing the timing belt and inspecting the tensioner every 30,000 miles is critical as the engine is an interference design. Some say this is even more critical in the DOHC 24 valve motor. American market 164's came with various yellow warning stickers on the black front cross-brace above the radiator (“Careful, the coolant you are about to enjoy is hot!”). I would do a little research on whether European Q4's came with similar stickers as there are none on this car. The interior looks good with its space age dash and Recaro seats. The Recaros were optional on the non-Q4, 164Q and some American magazine testers complained about them being tight (vs. admitting their BMI was high). Another thing to look out for with a 164 is the infamous stepper motors and gears that control the automatic climate control. The plastic gears eventually strip, and its a big job to dis-assemble the dash to replace them. Also, the 24 valve cars has an LCD display that looses segments over time. The AWD system on the Q4 was co-developed with Steyr-Puch. The system consisted of a viscous coupling unit, central epicyclic differential and Torsen differential in the rear. It was connected to the ABS and Motronic engine management computers, which managed the torque split front to rear and side to side. The Q4 was never sold in the U.S., so this car being a 1995 is just a couple of years short of the 25 year exemption (those lucky Canadians and their 15 year rule). The central question is: peel the “4" off the rear badge and sneak it in as a 164Q or rent a garage in Canada for the next 4 years? Gianni is Daily Turismo’s pacific Northwest correspondent and resident Alfista. Originally written by Gianni and published as Patience Prudence: 1995 Alfa Romeo 164 Q4 on Daily Turismo.